If you are interested in growing some of your own food but do not want to commit to a full backyard garden or do not have much space with which to work, a patio hanging garden might be the perfect choice for you. Hanging gardens add color and texture to your outdoor living areas while also enhancing privacy and providing foods for you and your family to enjoy. They can help you maximize your patio or balcony space without taking up usable square footage on the ground. This allows you to grow more food in containers on the ground, add chairs or a table for entertaining, or simply leave the area open for a more spacious feel. 1. 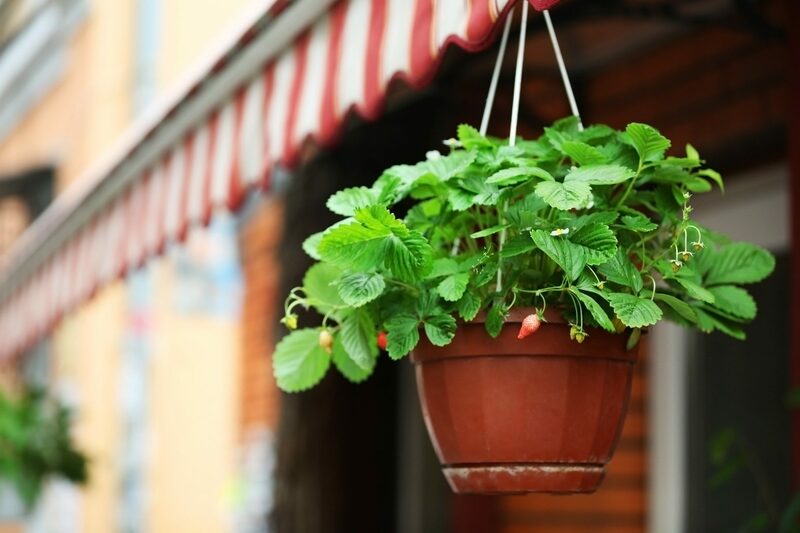 Strawberries: Strawberries are kind of the go-to plant for folks who want to grow food in hanging planters. They are easy to grow, do well in containers and are loved by almost everyone. Aside from their universal appeal and ability to thrive on your patio, another reason you may want to choose strawberries for your hanging garden is that commercially grown strawberries have higher levels of pesticides and other chemicals than nearly any other food crop. For folks who are concerned about the chemicals on their food, this means either buying higher-priced, organic options or growing their own. Because of their shallow root system, you may need to water your strawberries more often than other food plants in your garden. 2. 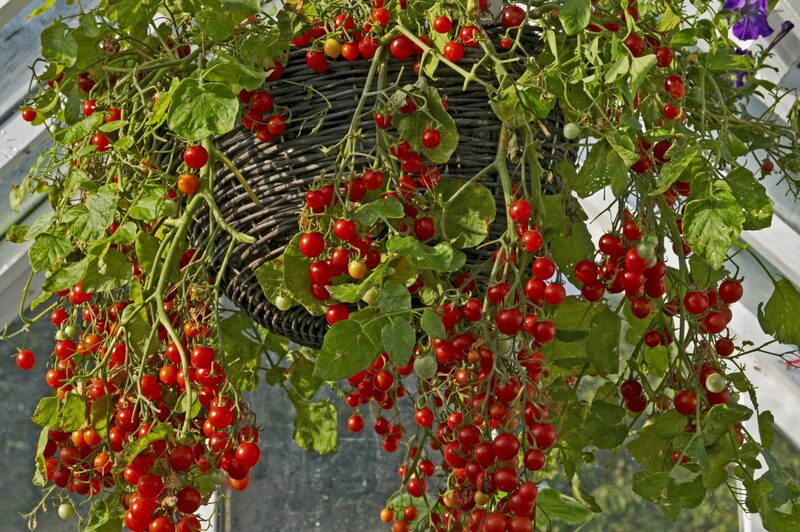 Cherry Tomatoes: This is another option that is incredibly popular for hanging gardens and for backyard gardens, in general. In fact, some variety of tomatoes is usually the first thing new gardeners test out their gardening skills on and are easy to grow, even for folks who do not have green thumbs. Cherry tomatoes, in particular, are a good choice for container gardens and a good choice if you do not have much time to dedicate to tending to your garden. Bush varieties are the best choice when planning on planting your tomatoes in hanging baskets. 3. Carrots: Carrots may not seem like an obvious choice for a patio garden, but they can do just as well in containers as they do in the ground. Plus, their almost fern-like foliage looks less like a food crop and more like an ornamental plant for decorating your outdoor living area. Be sure to choose shorter varieties that require less room to grow. 4. 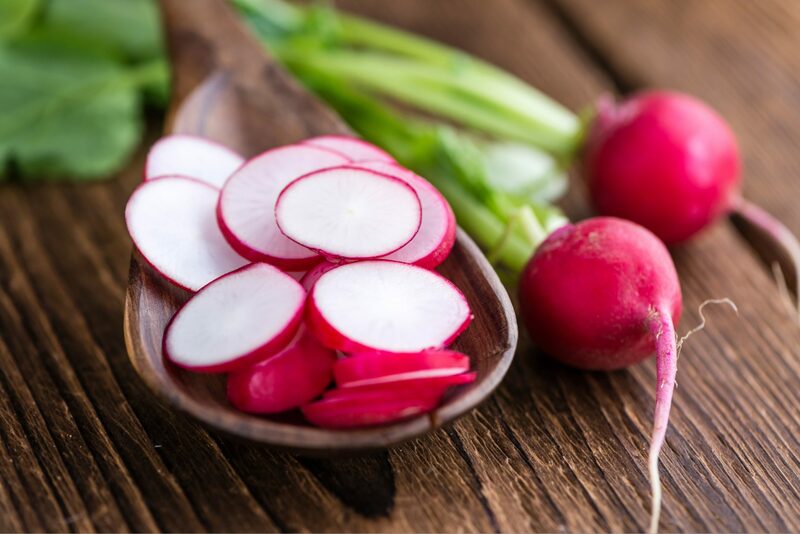 Radishes: Radish leaves are not nearly as visually appealing as the foliage found on carrots, but these little root vegetables are incredibly easy to grow, mature quickly and thrive in containers. Since you can usually pick radishes around 30 days after germination, you can get at least three or four harvests before the weather heats up too much and it is time to fill that basket with a different crop. 5. Spinach: Lightweight and easy to grow, spinach is a nutrient-dense, leafy green that thrives in container gardens. The deep green of the leaves is a great way to add color to your patio, and spinach plants that are well cared for can be quite productive. Every potager should include at least a few spinach plants for use in salads and side dishes, so choosing them for hanging planters is a great way to include them in your garden without taking up any space on the ground. 6. Kale: Kale plants can become rather large when allowed to grow unchecked, but if you are harvesting your kale leaves regularly, you can keep your plant tamed enough to look quite lovely in a patio hanging basket. An added bonus of choosing to grow this superfood is that you can choose from a variety of gorgeous hues to add a pop of color to your patio. Ranging from medium greens to deep purples, this easy-to-grow, leafy green is a solid choice for patio gardens. 7. Lettuces: Lettuces are lightweight and thrive in containers, which makes them a good choice for hanging basket gardens in outdoor living areas. Unlike tomatoes, lettuce plants rarely get out of control, so they keep a mostly well-maintained appearance with very little care. They do require more water than some other food plants, and most varieties prefer cooler weather, so you may want to include lettuces in your winter garden, and then switch to a different fruit or vegetable during the summer months. Growing food in hanging baskets is not much different than growing plants in other types of containers. 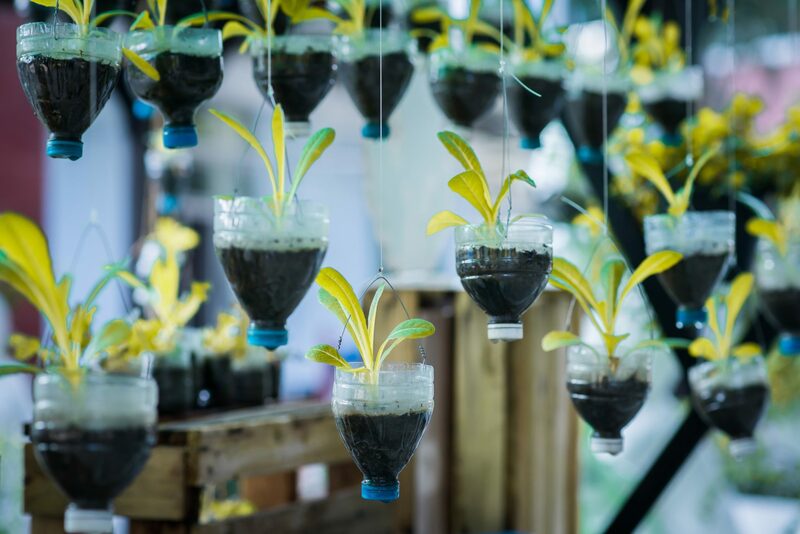 In general, anything that you grow in a container – hanging or otherwise – is going to require more water and more frequent applications of fertilizers. Therefore, you will need to keep a closer eye on soil moisture and add calendar reminders to keep your plants well fed. Something else to keep in mind is that hanging planters can be quite heavy, so be sure to install your hooks and planters properly to avoid falling planters that can hurt a person or pet, or damage your patio or deck. You will also want to make sure that you harvest fruits as they become ready, which will help keep your baskets from getting any heavier than necessary. While it is not a necessity, you may want to consider an extension wand with a spray nozzle for your garden hose. This will make it easier and more convenient to water your hanging garden. What is your favorite fruit or vegetable to grow in your patio hanging garden?